PLOT: Young pilot Han Solo escapes life on the streets of Corellia and joins a gang of outlaws to assist in a daring heist. Along the way he helps free the Wookiee Chewbacca from slavery, meets the famed smuggler Lando Calrissian and flies aboard the Millennium Falcon for the first time. Warning! As with all our Star Wars reviews, we try to avoid spoilers, and there aren’t many in this film, but if you don’t wish to know anything about the plot or characters before watching the film then we recommend that you read this review after seeing it. It’s been a challenging time for Lucasfilm and the Star Wars franchise over the last 12 months. After the huge success of The Force Awakens and Rogue One, The Last Jedi was generally well-reviewed and made plenty of money at the box office, but fan reaction was divided. Some loved the bold direction of Rian Johnson’s story, whilst just as many proclaimed it one of the worst films in the entire saga. Some disillusioned fans even went so far as to say they’d never watch another Star Wars film! What Lucasfilm really needed was a safe bet for their next offering from the franchise, but by then Solo was well into post-production and had troubles of its own. Original directors Phil Lord and Christopher Miller has been fired due to creative differences and the film had been placed in the seemingly safe hands of Ron Howard, who reportedly re-shot over 70% of the film. 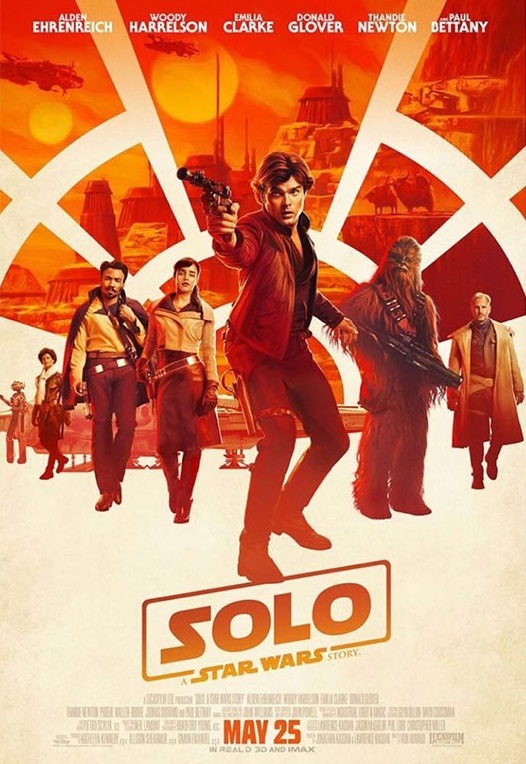 The biggest issue though was that many fans just weren’t interested in seeing a Han Solo film that didn’t star Harrison Ford as the beloved scoundrel. The late release of trailers did nothing to dispel the feeling that this was a movie that didn’t need to be made, despite the footage looking quite good, and audience apathy was certainly evident as I attended an early evening screening on Friday 25th May with no more than 25 people in attendance. The core story of Solo takes place around ten years before the events of A New Hope. The Empire is well-established but criminal syndicates pose an equal threat in many parts of the galaxy. Having escaped from the near-slavery of a gang led by the vile Lady Proxima, our hero enlists in the Empire hoping to become a great pilot. His inability to follow orders sees him demoted to an infantryman and it is then that he meets a criminal gang led by Tobias Beckett (Harrelson), and ultimately deserts the Empire to lead the life of an outlaw. He joins Beckett’s gang to help with a heist of valuable fuel, but not before meeting a certain walking carpet and helping free him from slavery. When the job goes wrong, Solo and Chewie agree to aid Beckett in settling his debt with gangster Dryden Vos and plan an even more daring robbery with the assitance of Han’s old flame Qi’ra, former smuggler Lando Calrissian and a certain spaceship that we all know and love. It’s a pretty simple story, combining a heist movie with western elements, and would be dismissed as generic if it wasn’t for the fact it takes place in the Star Wars universe. As the first film to be completely disassociated from the main saga, the usual themes of family, the Force and the battle between good and evil are thrown out. Instead we see a side of the universe that has only previously been hinted at in scenes like the Mos Eisley Cantina and Jabba’s Palace; a seedy criminal underworld where everyone is out for themselves and the most valuable assets are a good blaster and plenty of luck. It also means there’s little time for the drama we’ve seen in recent Star Wars films, as character development and spiritual conversation give way to two hours of almost non-stop action and adventure. 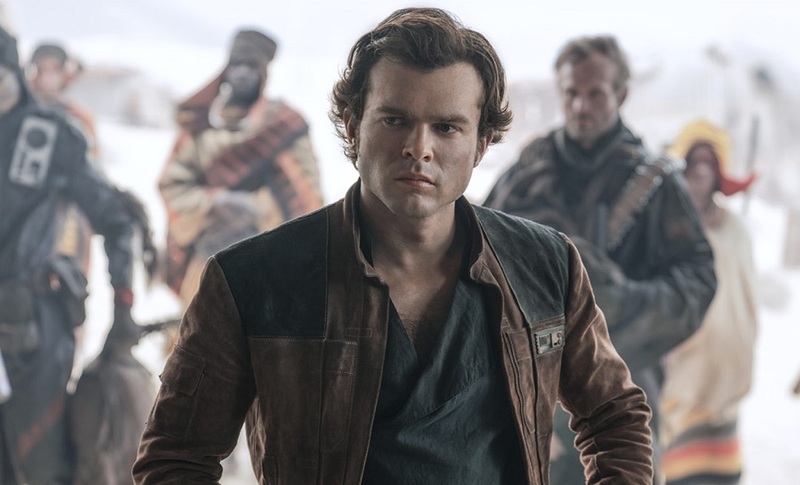 The big question everyone had going into this film was bound to be whether Alden Ehrenreich has successfully stepped into the shoes previously filled by one of the biggest Hollywood stars of the last 40 years. Let’s be straight – he’s no Harrison Ford, but he wasn’t employed to play Harrison Ford; he was employed to play Han Solo, and he does a decent job. It takes ten minutes to get used to him in the role, but in a smart move the film begins with a prelude to the main story, so you have a chance to get to know him before things really get going. Ehrenreich’s portrayal of the character certainly has similarities to Ford’s, as the younger Han is just as cocky and reckless as his older self, but there is also an innocence and optimism in this version compared to the cynical, self-centred character that greets Obi-Wan and Luke Skywalker in the Cantina. One of the interesting aspects of the film is seeing the beginning of the character’s development, and by the end of the film the young Solo is a little bit closer to the one we know from the original trilogy. It is to Ehrenreich’s credit that after that first ten minutes, I accepted that he was Han Solo and didn’t compare him to Ford’s version at all. If there were similar doubts about Donald Glover’s casting as Lando Calrissian, then it doesn’t take ten minutes to dispel them. From the moment you see and hear him, he captures the all swagger and bravado of the coolest dude in the galaxy. His involvement in the story is actually quite limited but every moment he is on screen is enjoyable and it would be a real missed opportunity if we never saw Glover in this role again. The trio of familiar characters is of course completed by Chewbacca, played once again by Joonas Suotamo who took over from Peter Mayhew for the physical side of the character in The Force Awakens. Chewie’s invovement in this film is substantial and while he does provide humorous moments, there’s no recurrence of the cheap Porg-related gags from The Last Jedi here. We also get some of the character’s back story and see him at his most ferocious as he frees some of his fellow Wookiees from captivity. The remaining characters are all new to the franchise and are something of a mixed bag. Woody Harrelson is perfectly acceptable as a kind of mentor figure to Han, while Paul Bettany plays syndicate leader Dryden Vos exactly as you’d expect without leaving a lasting impression. Emilia Clarke plays the love interest Qi’ra and while she does have a significant role in the film, it’s a pretty forgettable performance for the most part. With Game of Thrones, The Terminator and now Star Wars in her locker, at least she will make a good living at Comic-Cons when the acting work dries up. The most memorable new character is once again a droid, and after K-2SO in Rogue One it looks like every Star Wars anthology film is going to get its own sarcastic robot. This time around we have L3-37, a female-voiced activist for droid rights and co-pilot to Lando. She definitely has some great moments in the film and is responsible for much of the humour. Speaking of droids, Solo is notable for being the first Star Wars film not to feature C-3PO and R2-D2, but fear not; Anthony Daniels still gets to keep up his perfect record of appearing in every film as he plays one of the Wookiees. Another familiar face from the franchise is Warwick Davies, who worked with Ron Howard on Willow, and he gets a rare opportunity to act without a ton of make-up on and even gets a few lines. There’s also a rather bewildering cameo from a character that we’ve not seen for a long time, but to say any more would reveal one of the few spoilers in the film. There is one other character of sorts that we’ve seen before of course – the Millennium Falcon. In this film the ship belongs to Lando, and she’s a lot more sleek and shiny than we’re used to. We get to see areas of the ship not seen in previous films, and much like when they were reunited in The Force Awakens, the moment where Han and Chewie first set eyes on her is sure to bring a smile to the face of most viewers. We get to learn a little about why the ship means so much to Han and it also sees plenty of action throughout the film. Lando’s Millennium Falcon is shiny and new in Solo, at least to begin with. So the characters and acting are pretty decent, but is the film any good? As long as you’re not expecting too much then yes. There’s great chemistry between the characters, an abundance of action sequences, and a lot more fun than we saw in the first anthology film. As you’d expect, the character and set design and special effects are the usual high standard and given the issues the film had during production, Howard has made an enjoyable film that has the Star Wars vibe that the previous directors seemed to be struggling with. We’ll probably never know exactly how much of the film was shot by each director, but the end result flows pretty well for the most part. As always there are a couple of gripes. The trailers suggested the score might have a different style to the norm, with the possibility of a Western film infuence and maybe even guitars. Once again however, John Powell’s music is the usual orchestral style, and while it is better than Michael Giacchino’s effort on Rogue One it still relies heavily on the John Williams cues we know so well. The soundtrack for the recent Thor: Ragnarok proved that a non-orchestral score can work in these kind of films, so hopefully they will take that risk on one of these anthology films eventually. That said, any score that incorporates the Asteroid Field music from The Empire Strike Back can’t be criticised too heavily. The other issue is with the story. As mentioned, it’s fairly straightforward, but it also serves as something of a checklist for the key events in Han Solo’s life that we know about from the original trilogy, and it seems incredibly convenient that they would all occur during the course of this one adventure. It suggests that this film was designed to be a one-shot deal for the character, and yet the end of the film definitely leaves certain story threads open for continuation in a sequel. Given the lack of interest in the film, that’s probably not going to happen anytime soon, but I certainly wouldn’t object to seeing these characters embark on another adventure in the future. In conclusion then, the film certainly exceeded the admittedly low expectations and should be seen as something of a triumph for those involved, as they pulled an entertaining film from what could’ve been a disaster. It doesn’t add any depth to the Star Wars universe, but after the bleakness of Rogue One and the uneven storytelling of The Last Jedi, this film does bring back the fun and is a reminder of why we fell in love with these films in the first place. If you can’t enjoy two hours of gun fights, space chases, exotic aliens and one-liners then it’s probably time to question whether Star Wars is the franchise for you. Exceeding most people’s expectations and bringing the fun back with plenty of adventure and excitement, Solo may have been the Star Wars story nobody wanted, but it might just be what the franchise needed. Whilst there is much I can agree with in Mat’s review, there is one major disagreement and that is when he states that this is film that ‘didn’t need to be made’. It appears I am in the minority, but I was excited to explore the world of Han before the rebellion came calling. In hindsight this may be the main reason why Mat left the film on a high, whereas I was deflated and disappointed. Despite some likeable characters and performances (most notably Ehrenreich in the lead, Paul Bettany as bad guy and the genuinely funny L3-37), but some of the others left a lot behind. 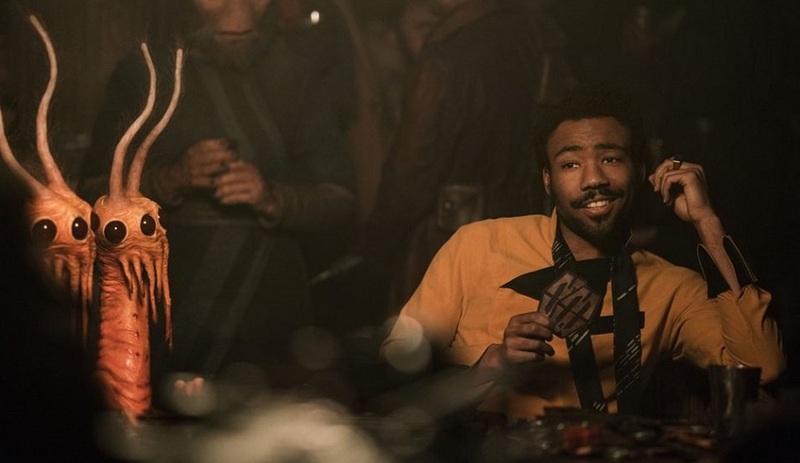 The love interest was almost completely devoid of character and chemistry, Harrelson was subdued and even the lauded Donald Glover was unconvincing as Lando. This was probably just as hard a role as following Harrison Ford, but I felt it was too much of a copycat response and wished we had seen a more nuanced portrayal (though this may have been difficult given the limited screen time afforded to the character). I was also disappointed by how simple and obvious Lando’s cards shenanigans were. If he was as blatant as that in other games he would have lost his life never mind his ship. My biggest concern with Solo though lies squarely with the Kasdan’s script. For a two and a quarter hour film I came away knowing nothing new about Han. Nor did I feel that I understood his motivation to become one of the galaxy’s greatest smugglers. Far from the big time gambling and money driven character that Ford portrayed, this character was a bit of a sap and I feel like we are still another film away from actually getting to the root of Han. This wasn’t a backstory, it was a single event that happened within the backstory and not a particularly interesting one at that. Now all this sounds like I am a it of a grumpy old man wanting Disney to make films like good old Lucas did and bemoaning the new world order, but that isn’t the case. I have been a big fan of all three previous Disney Star Wars films and was genuinely excited for this. But an average script, hit and miss characters, generic set design/effects and a massively overlong running time turned the viewing into a bit of a slog. I’ll certainly watch the film again and without the weight of expectation I may well enjoy it more, but of the 10 Star Wars films that have now been made (discounting the Ewok movies) I would probably put Solo in 9th place.